Creighton Professor Chats About Upcoming Segregation Lecture "Live & Local"
Dr. Patrick Murray, Professor of Philosophy and John C. Kenefick Chair in Humanities, joins Mike Hogan "Live & Local" to chat about the upcoming lecture that will explore the history of segregation of American’s housing during the 20th century. Author Richard Rothstein, who is a leading authority on housing policy, will discuss how radical segregation was due to de jure segregation – the laws and policy decisions passed by local, state, and federal governments – that promoted the discriminatory patterns that continue even today. 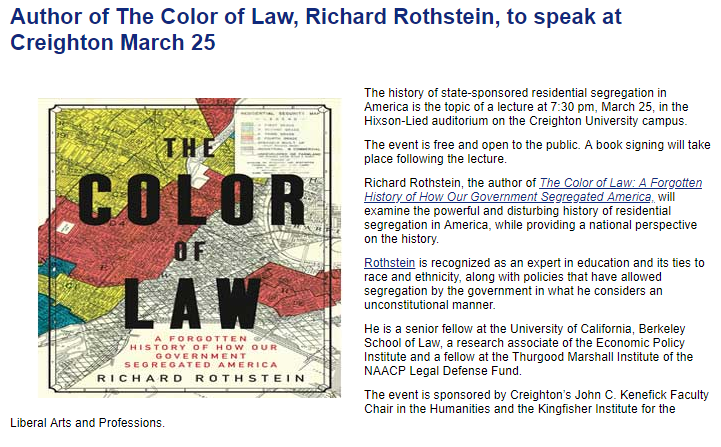 He will also discuss his book, "The Color of Law: The Forgotten History of How our Government Segregated America"
The event happens Monday, March 25, 2019 - 7:30pm - 8:30pm at Hixson-Lied Auditorium on the Creighton University campus.